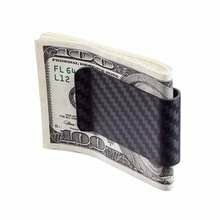 The KOOLSTOF™ carbon fiber money clip is the result of 8 years researching, designing and fabricating money clips. With continuous improvements combined with the springiness of carbon fiber this is the ultimate money clip. Producing high quality carbon fiber composites takes a lot of skill and experience and the proper design. Each clip undergoes a fine polishing process to provide a gleaming surface to show off the beautiful carbon fiber pattern. We believe you cannot find an equal or better quality money clip anywhere else for any price! We back this up with our 90 day money back guarantee. - Extra large holding capacity - up to 50 folded bills!! - Soft rounded edges for a smooth slide over bills and credit cards and it feels soft in your hands. - Springy carbon fiber construction. 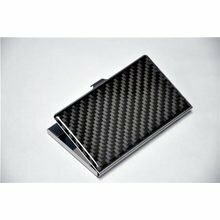 - Has that cool carbon fiber look (the benifit of using real, high quality carbon fiber) that changes its look as you rotate the money clip. A picture doesn't do this money clip justice. The Koolstof carries what I need! I owed 5 money clips in the past. Now I only use this Carbon Fiber clip. Got one for my mom and dad. I recommended it in my newly revised 'How to Live the James Bond Lifestyle' kindle book.